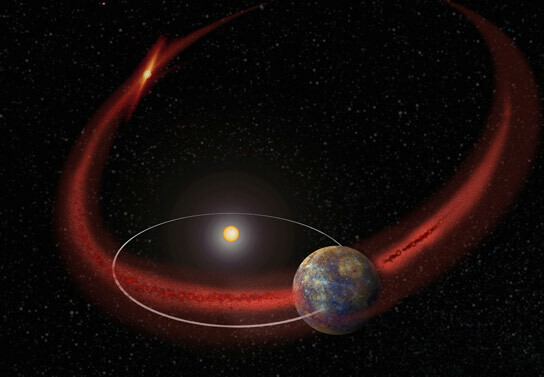 New data from NASA’s MESSENGER has revealed seasonal surges of calcium in the exosphere of Mercury, suggesting that a periodic meteor shower from the debris trail left by comet Encke is the source. The clues pointing to Mercury’s shower were discovered in the very thin halo of gases that make up the planet’s exosphere, which is under study by NASA’s MESSENGER (MErcury Surface, Space ENvironment, GEochemistry, and Ranging) spacecraft. “The possible discovery of a meteor shower at Mercury is really exciting and especially important because the plasma and dust environment around Mercury is relatively unexplored,” said Rosemary Killen, a planetary scientist at NASA’s Goddard Space Flight Center in Greenbelt, Maryland, and lead author of the study, available online in Icarus. A meteor shower occurs when a planet passes through a swath of debris shed by a comet, or sometimes an asteroid. The smallest bits of dust, rock and ice feel the force of solar radiation, which pushes them away from the sun, creating the comet’s sometimes-dazzling tail. The larger chunks get deposited like a trail of breadcrumbs along the comet’s orbit – a field of tiny meteoroids in the making. Earth experiences multiple meteor showers each year, including northern summer’s Perseids, the calling card of comet Swift–Tuttle, and December’s reliable Geminids, one of the few events associated with an asteroid. Comet Encke has left several debris fields in the inner solar system, giving rise to the Southern and Northern Taurids, meteor showers that peak in October and November, and the Beta Taurids in June and July. The suggested hallmark of a meteor shower on Mercury is a regular surge of calcium in the exosphere. Measurements taken by MESSENGER’s Mercury Atmospheric and Surface Composition Spectrometer have revealed seasonal surges of calcium that occurred regularly over the first nine Mercury years since MESSENGER began orbiting the planet in March 2011. The suspected cause of these spiking calcium levels is a shower of small dust particles hitting the planet and knocking calcium-bearing molecules free from the surface. This process, called impact vaporization, continually renews the gases in Mercury’s exosphere as interplanetary dust and meteoroids rain down on the planet. However, the general background of interplanetary dust in the inner solar system cannot, by itself, account for the periodic spikes in calcium. This suggests a periodic source of additional dust, for example, a cometary debris field. Examination of the handful of comets in orbits that would permit their debris to cross Mercury’s orbit indicated that the likely source of the planet’s event is Encke. The researchers created detailed computer simulations to test the comet Encke hypothesis. However, the calcium spikes found in the MESSENGER data were offset a bit from the expected results. This shift is probably due to changes in the comet’s orbit over time, due to the gravitational pull of Jupiter and other planets. The Johns Hopkins University Applied Physics Laboratory built and operates the MESSENGER spacecraft and manages this Discovery-class mission for NASA. Be the first to comment on "MESSENGER Reveals Possible Source of Surge of Calcium in Mercury Exosphere"